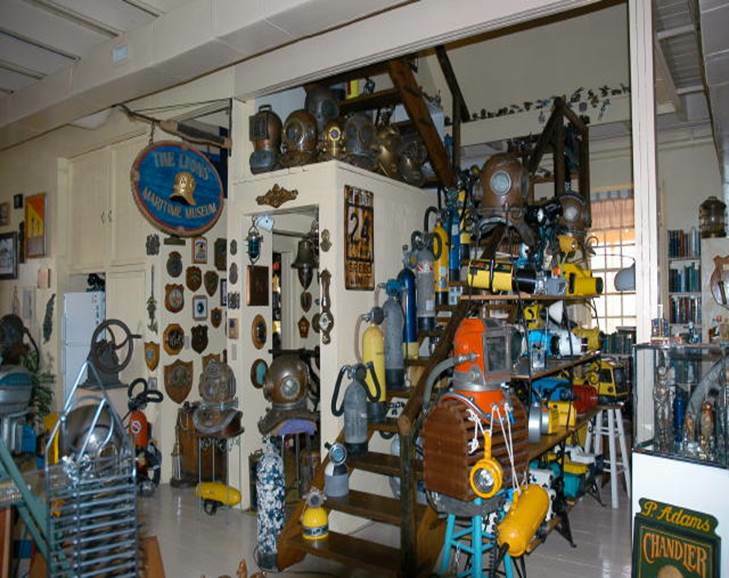 Internationally respected diving helmet authority, museum founder, author of HELMETS OF THE DEEP, and more. 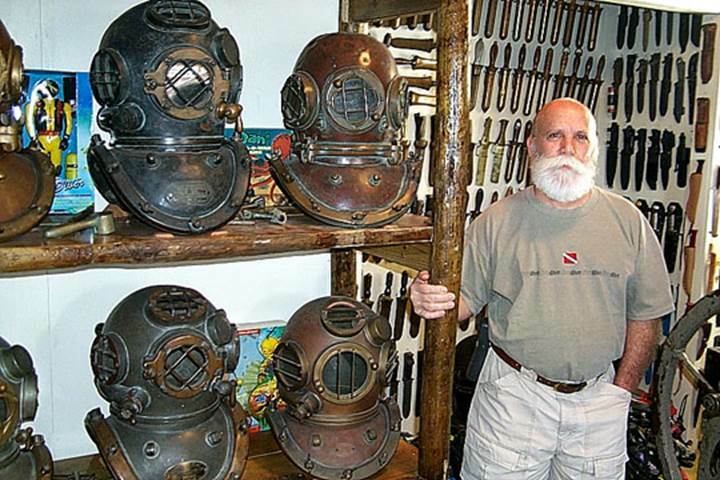 If you have any real interest in diving helmets, LEON LYONS is the man to see. 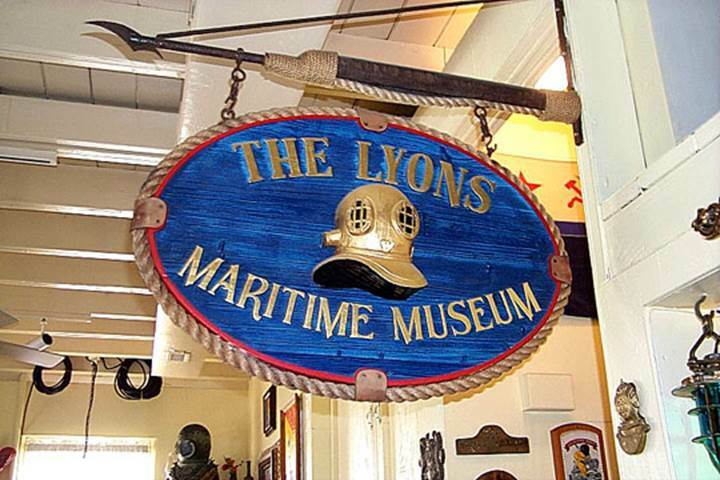 Here’s a look at the sign of THE LYONS MARITIME MUSEUM. May 1990 to November 1994. 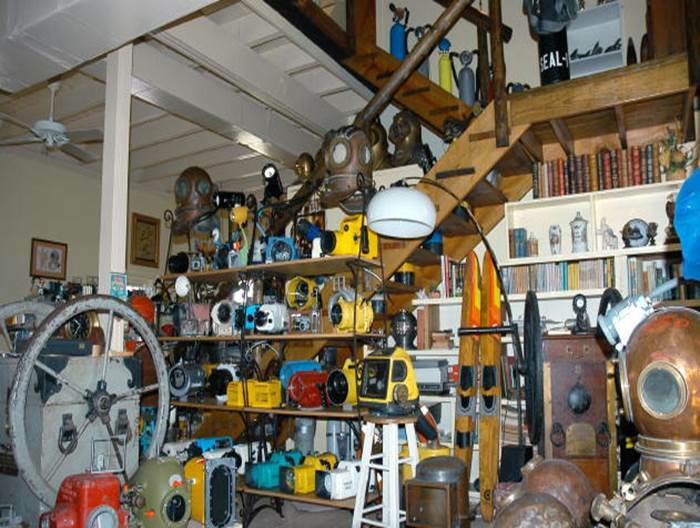 Here’s a look inside when the museum was still being set up. 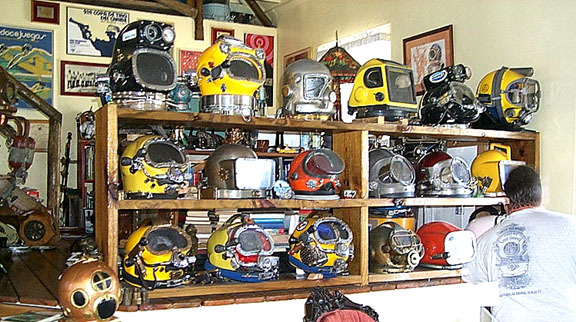 I’ve tried to count all the helmets in this view, and I think there’s close to 170 showing. 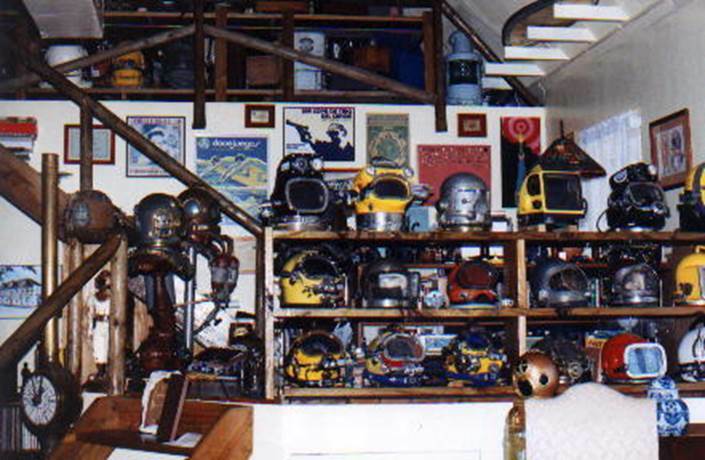 More were still in boxes when this picture was taken, as Leon’s collection includes more than 200 helmets. 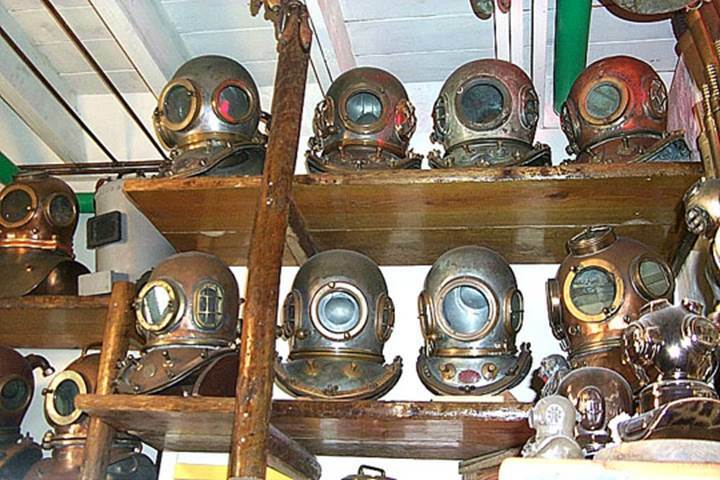 Helmets on display in the Lyons’ Maritime Museum. Kind of an interesting “low volume” hardhat: the silver one, second from the right on the top shelf. Probably a custom-made “one-off” unit. 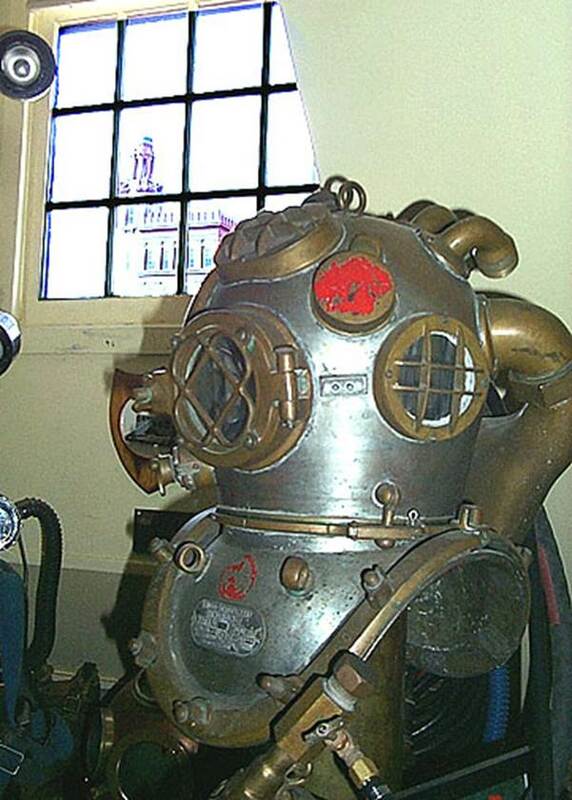 Somebody correct me if I’m wrong, but I believe this is a replica of the original DEANE DIVING HELMET: the first practical diving helmet in history. 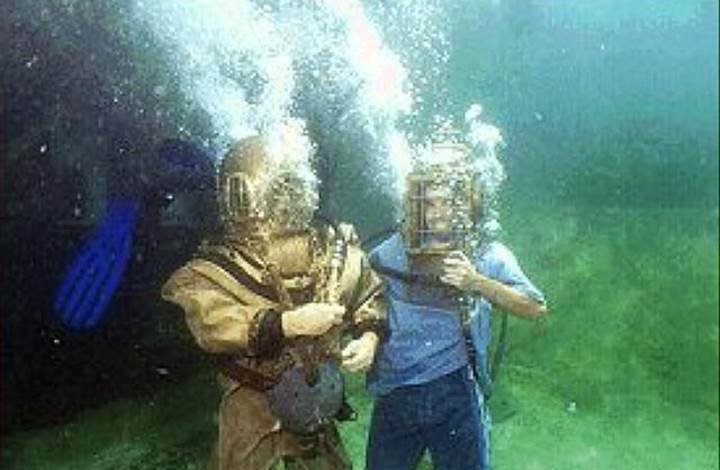 Based on the smoke helmet invented by Charles and John Dean in 1824, a version of this type intended for use underwater was made with the assistance of Augustus Siebe. Nice door: the watertight hatch from a ship. 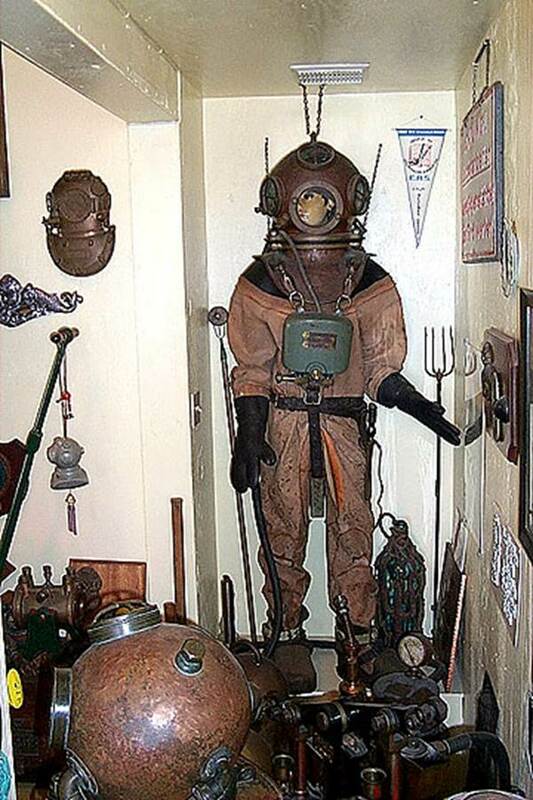 Just the thing for a maritime museum. Also, note the helmet to the left with a welder’s shield on the front face plate. 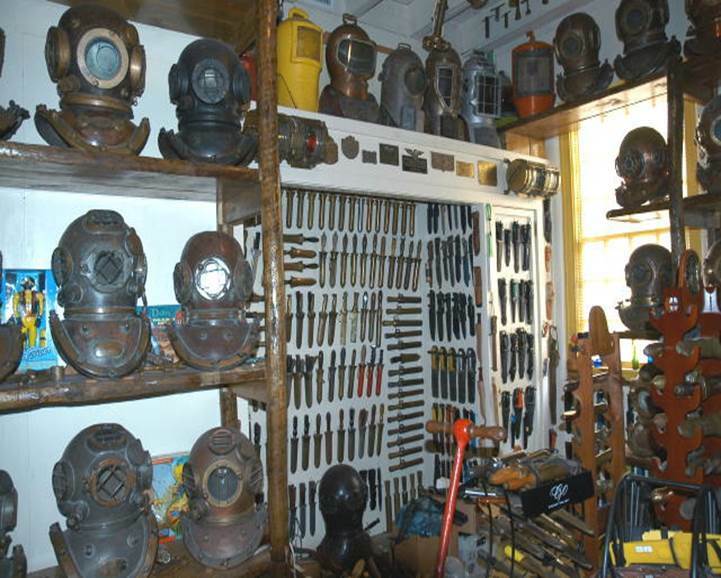 Lots of variety in Leon’s collection. 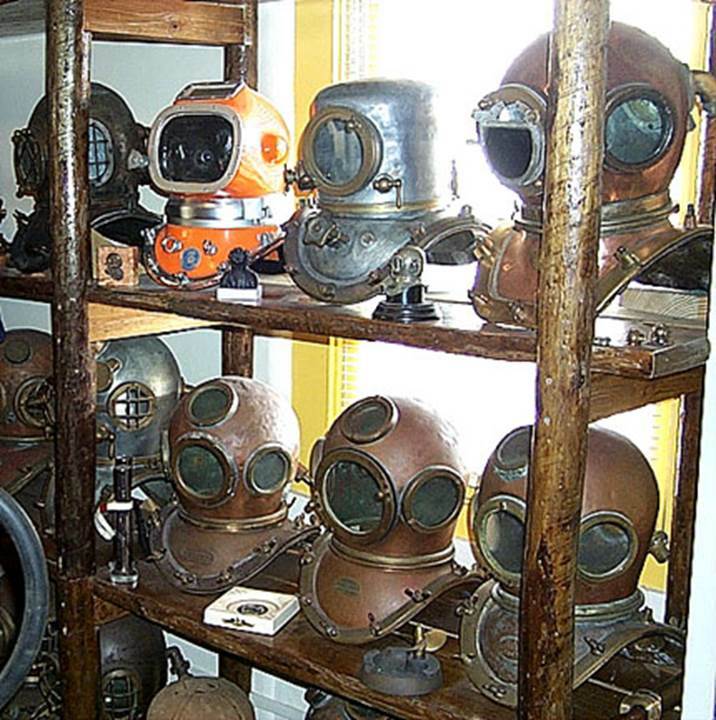 Here we see shelves filled with modern commercial diving helmets. The view from Leon’s front porch. 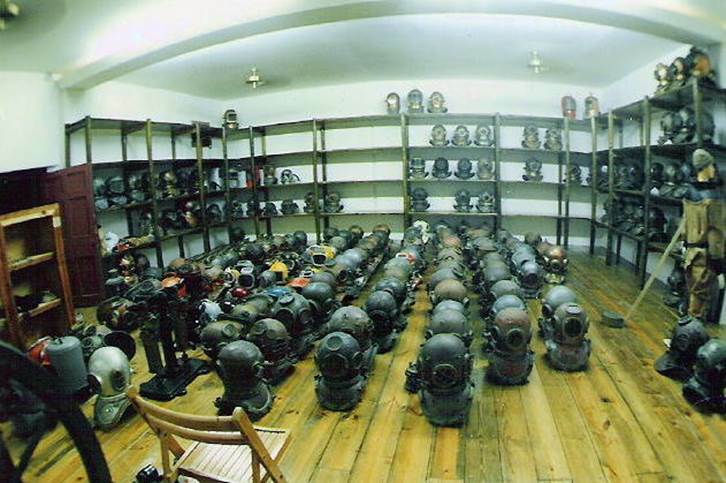 Here’s Leon with a few more helmets. 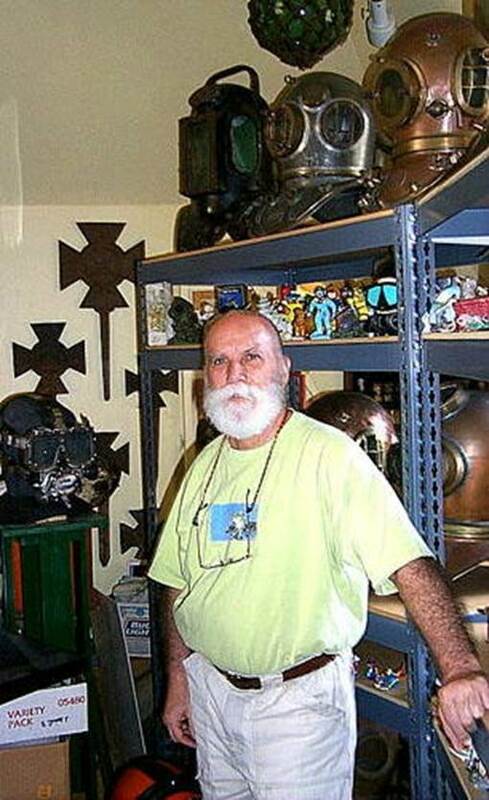 Behind him you see part of his extensive diving knife collection. 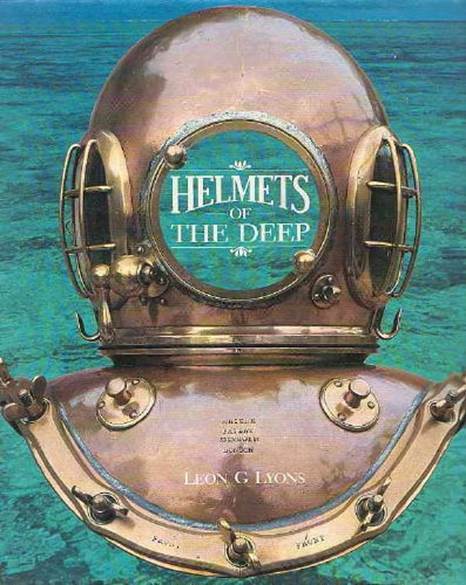 This is the cover of Leon’s book, HELMETS OF THE DEEP. Though very hard to come by these days, this book is considered by many to be the definitive text on the subject. 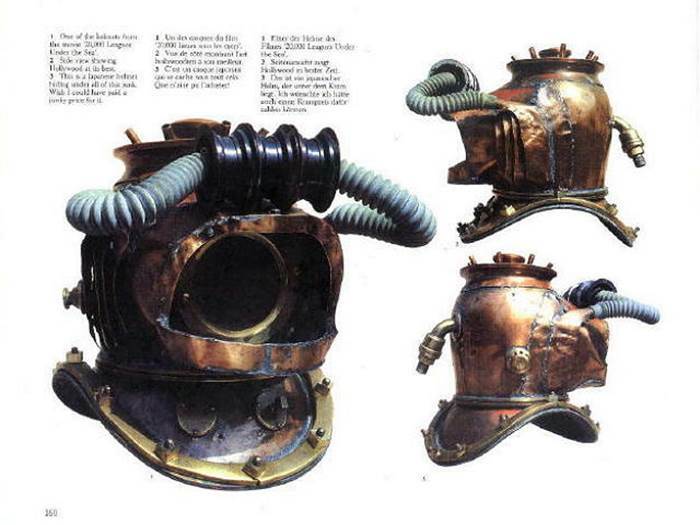 Here’s a page from HELMETS OF THE DEEP, showing one of the rare helmets in Leon’s collection: one of the few remaining examples of the artwork from Walt Disney’s 20,000 LEAGUES UNDER THE SEA. 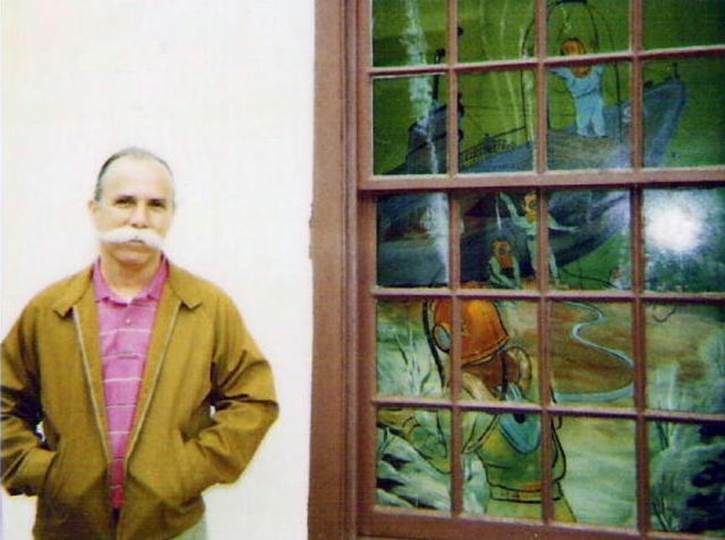 Jim Boyd provided this candid shot of Leon, taken on a recent visit to Mr. Lyons home in Florida. 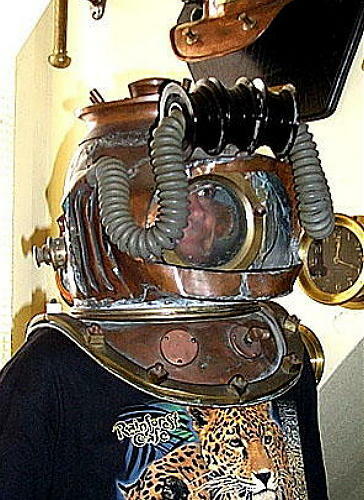 Boyd also provided this shot of his friend Dave Hill wearing Leon’s 20,000 LEAGUES helmet. 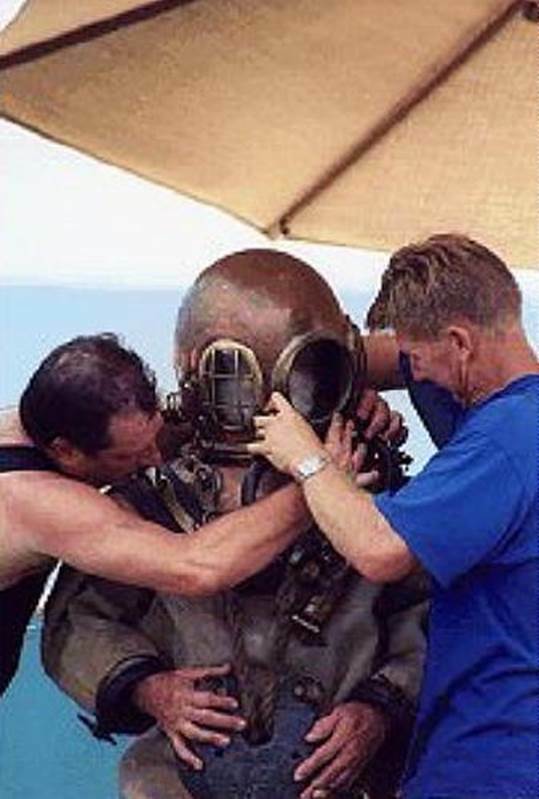 Tenders securing Leon’s helmet to the breastplate. 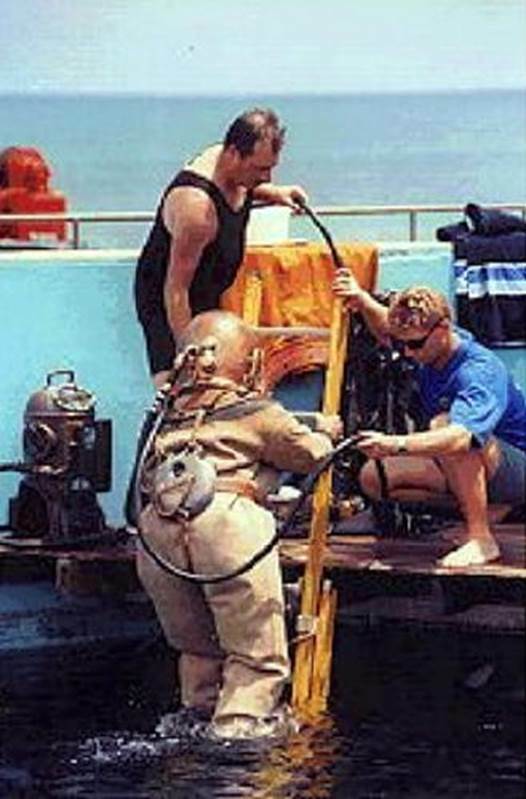 All suited up and on air, Leon descends the ladder into the MARINELAND tank. Leon explores the MARINELAND tank, but nope! No creature here today. 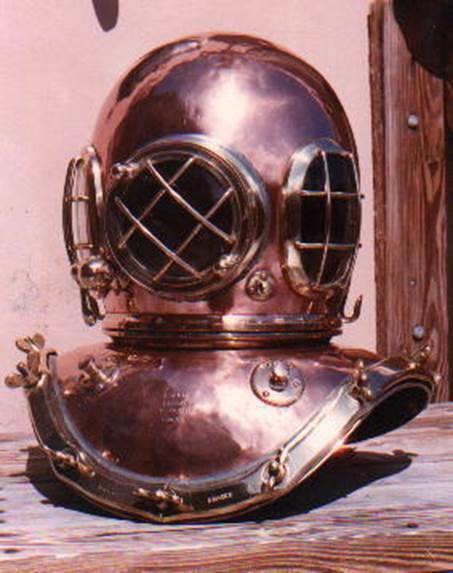 However, Leon was joined by his son Kimlin, wearing this MILLER-DUNN shallow water diving helmet. 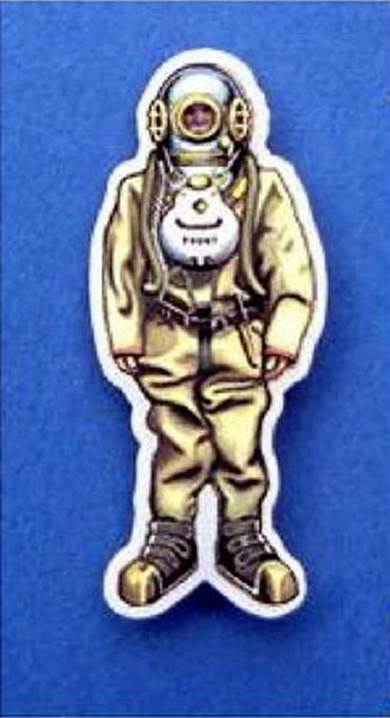 This is a cloisonné pin I found on eBay, representing a diver in antique Siebe diving gear. I thought it sure looks like Leon, and then I learned that he actually was the inspiration for this item. 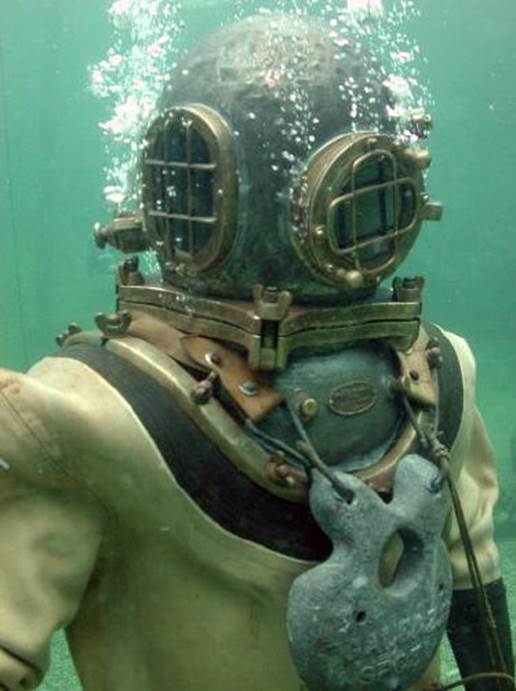 Here’s a look at Leon diving yet another of his rare antique rigs: a 1910 MORSE 5-Bolt. Here’s a view of a second floor room in Leon’s penthouse on the beach in Puerto Rico. 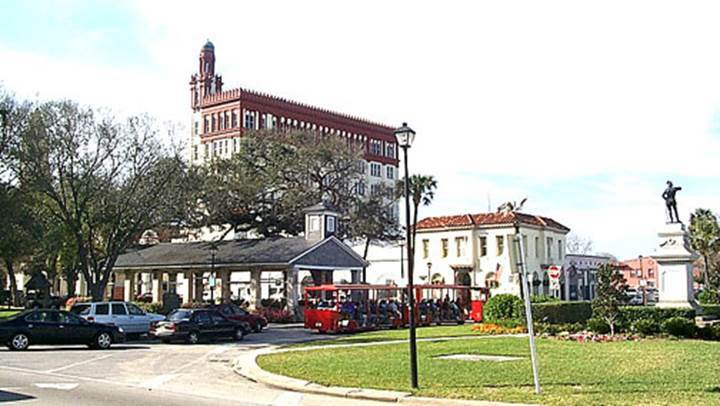 This is the office area in Leon’s home in Florida. 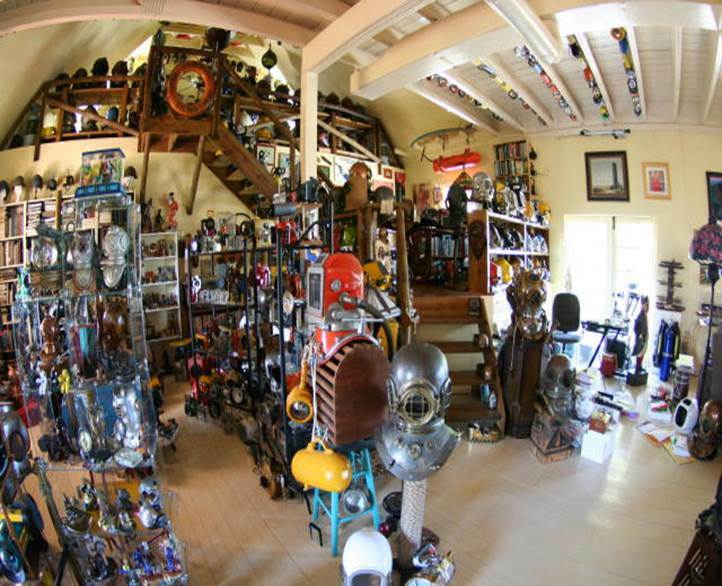 The stairway leads up to the loft where some 70 helmets reside; plus 60-odd pairs of diving boots and diver sandals, maybe one thousand pounds of weight belts and chest weights, a few hundred depth gauges and compasses, and many more items. 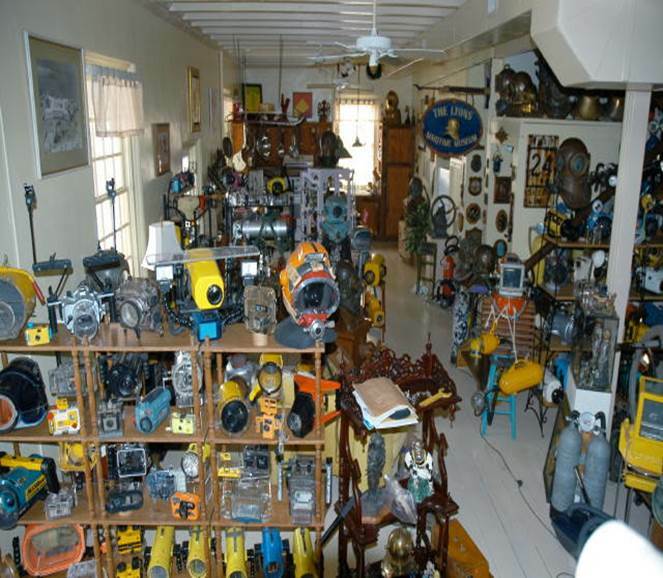 This is only a very small part of Leon’s amazing collection. Notice the marksmanship posters on the wall? Besides being a diving helmet expert, Leon is a crack shot and has competed on several shooting teams. 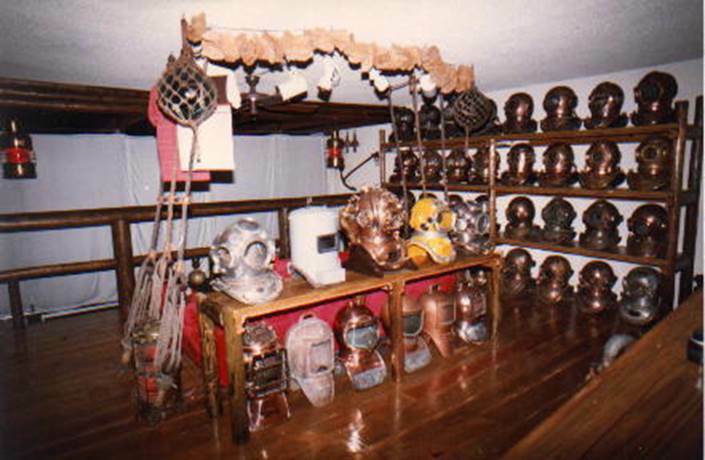 Here’s a look into a converted guest room in Leon’s home, holding approximately one hundred helmets. 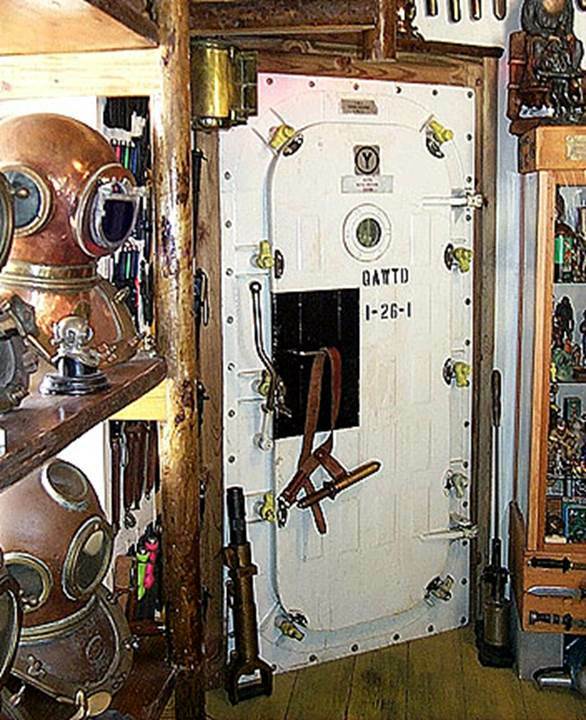 The water-tight door and frame is solid stainless steel with brass moveable parts, weighs 350 pounds, and leads to the head, where some several hundred diver's scuba and seal team knives are hanging on the walls, plus three diving helmets on the floor, and other goodies. The water-tight door came off a 1950’s US NAVY minesweeper that was scrapped in Holland. Leon estimates his knife collection at somewhere around 1300 items. Perhaps one day Leon will allow us to do a complete display of his home, showing the entire collection; if my server has enough webspace for it all, that is! 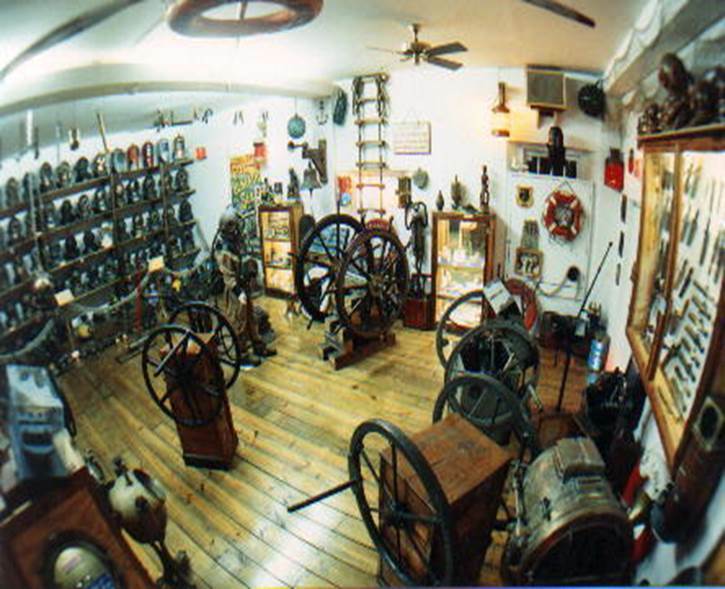 J Meanwhile, keep your fingers crossed that Mr. Lyons may open a Virtual Living Maritime Museum in the future. It will really be something to see! Leon sent us a CD of pictures showing his museum as it stands today. It’s such a great collection, I hope I can do it justice. 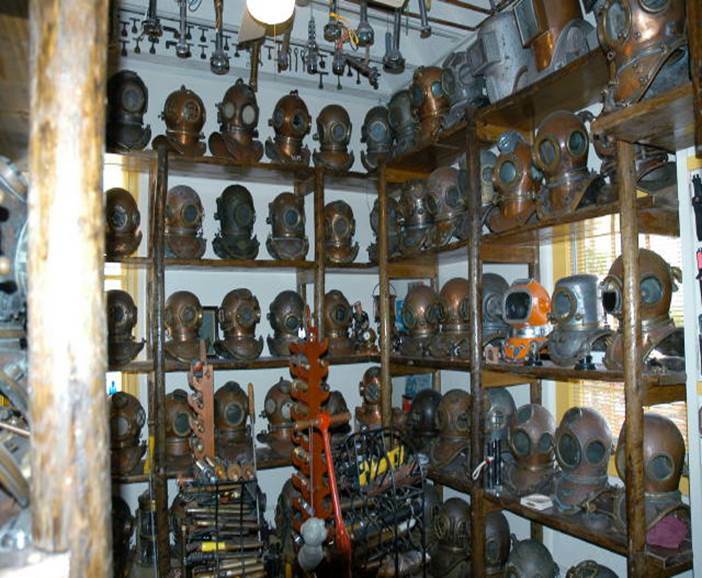 Here’s another look into the domain of one of the most widely respected authorities on diving helmets in the World. What’s apparent here is that title was not bestowed without good reason. Leon really lives it. A beautiful Seibe, U/W Video Housings, diver propulsion units, and other items you might not see elsewhere. 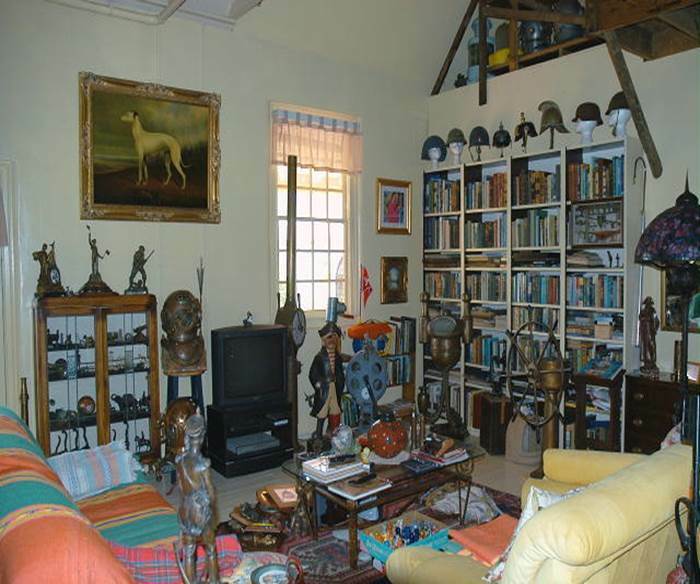 The Library area includes a collection of vintage militaria. Air pumps, all sorts of air hats, etc. 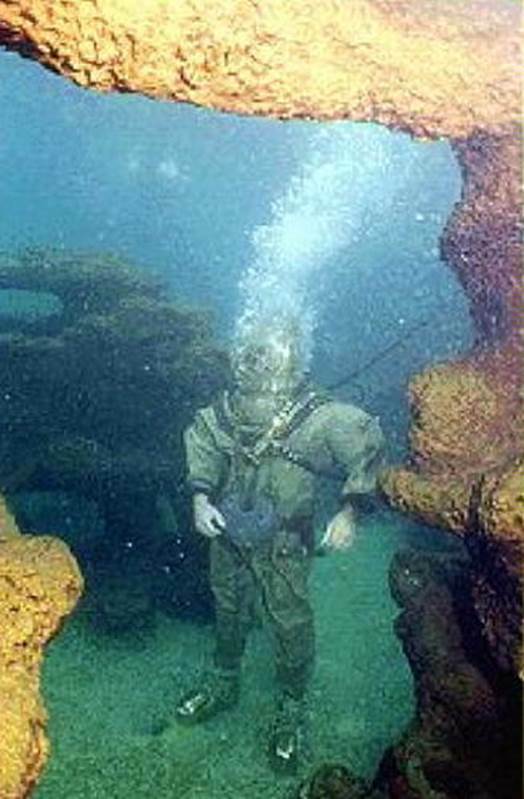 If it has to do with diving, you’ll probably find it here. The stairs leading up to the loft. 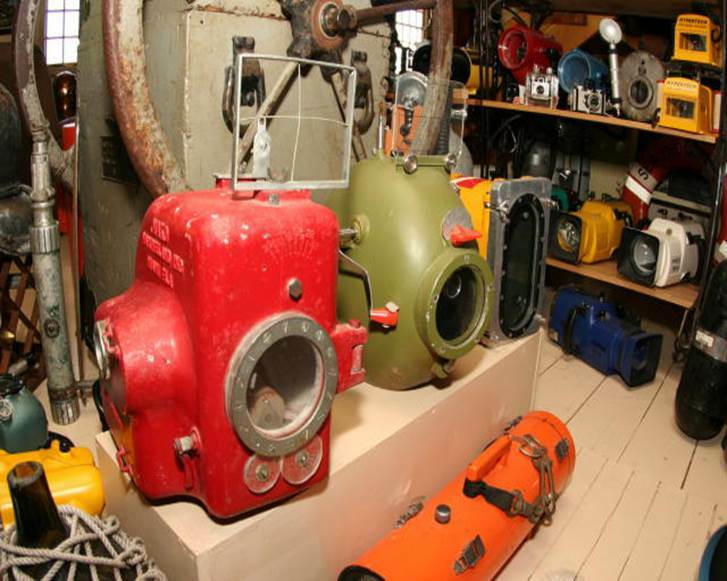 We see vintage SCUBA gear, and numerous awards. 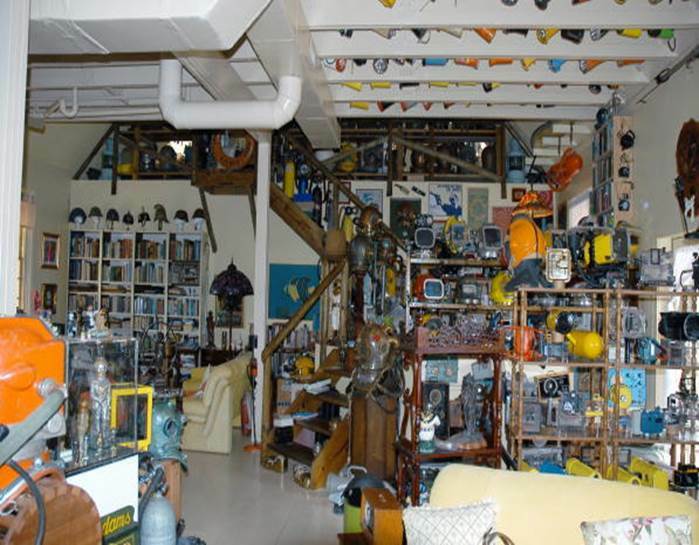 A wide angle view of Leon’s home, looking toward the loft area. Yet another view, as we browse around enjoying the many sights. Looking in another direction, we see numerous camera housings, and more. 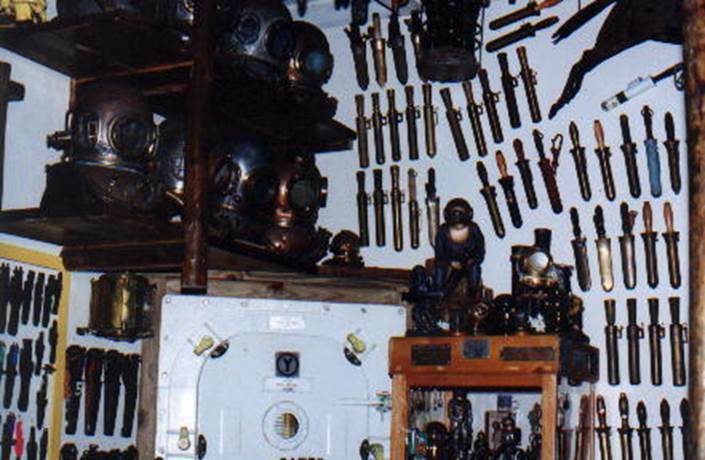 Let’s take a look at only a small part of the gigantic dive knife collection Leon owns. 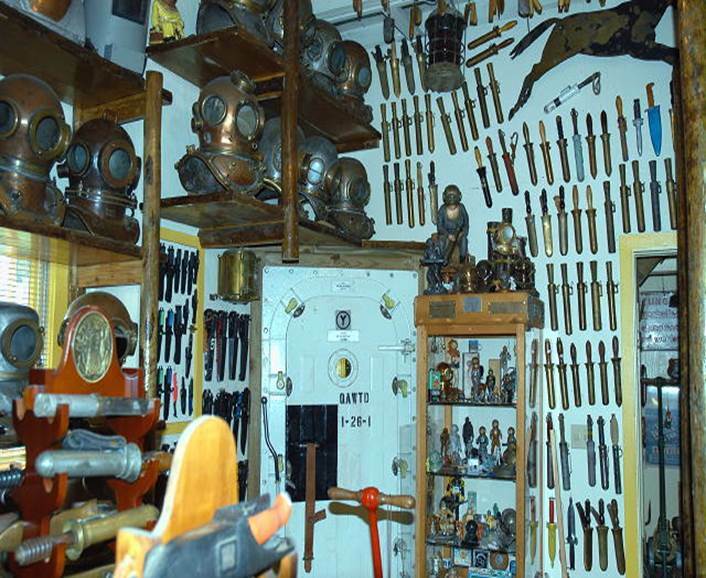 Here we have a display of traditional hardhat diving knives with brass scabbards. 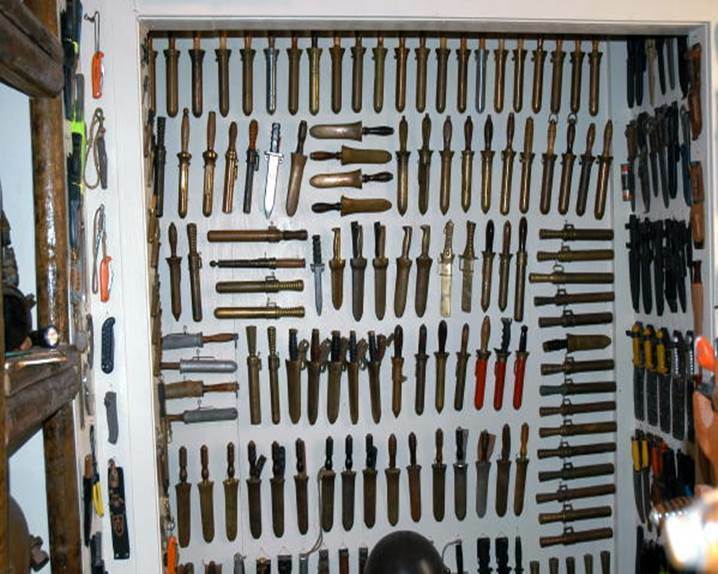 There are literally thousands of knives covering most of the walls. 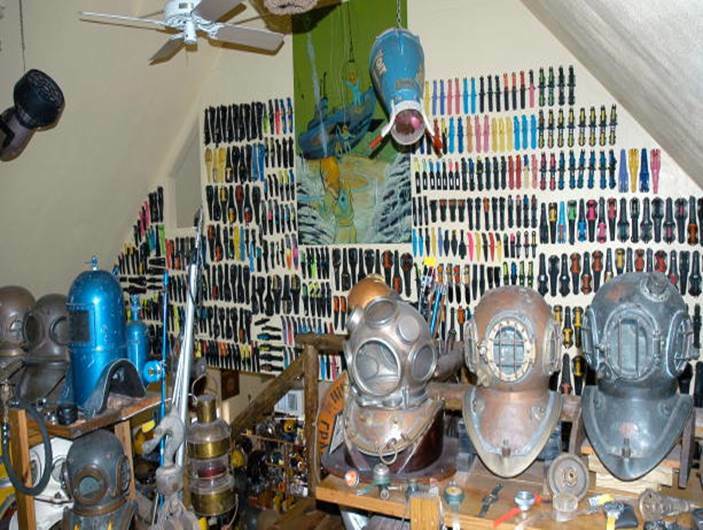 Up in the loft, we see just a few items in Leon’s SCUBA diving knife collection. And of course, everywhere we look, we find helmets of every kind. 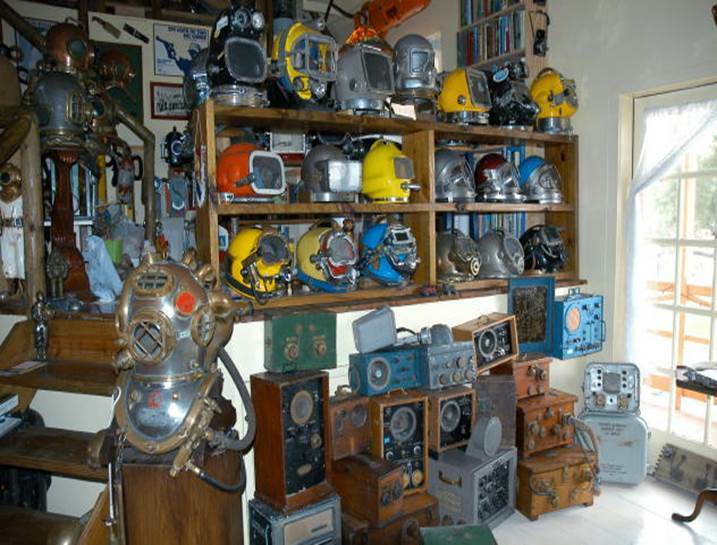 This beautiful MkV helium helmet stands at the foot of the stairs to the loft, alongside commercial air hats and dive coms. 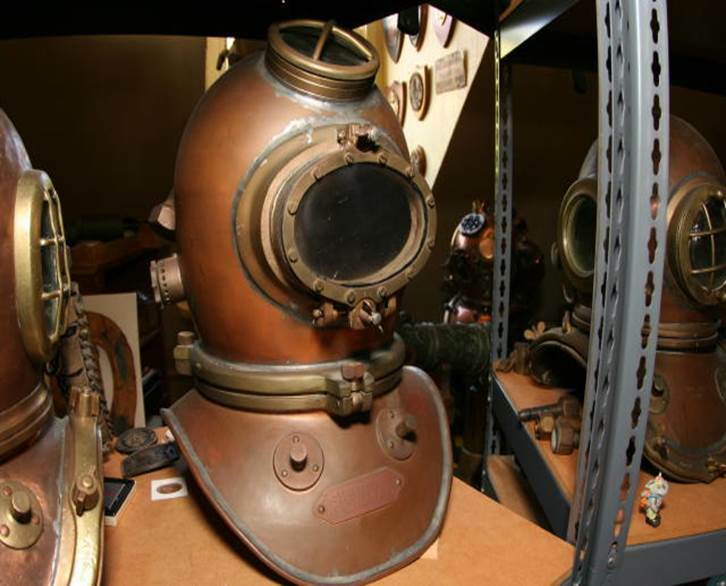 And here’s another look at one of our personal favorites: Leon’s NAUTILUS DIVER helmet from Walt Disney’s 1954 movie version of Jules Verne’s 20,000 Leagues Under the Sea. Many thanks for giving us this look at your fantastic collection, Leon! 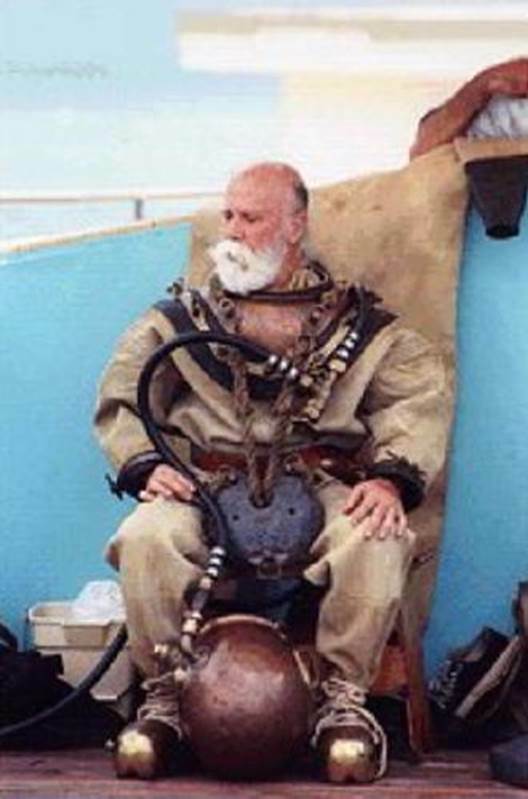 As I’ve said before, Leon is considered one of the (some say the) foremost authorities on diving helmets in the World. 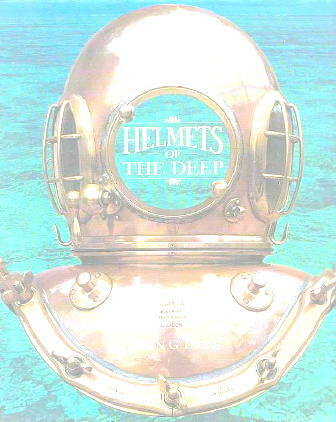 His book, HELMETS OF THE DEEP, is considered by many to be “the bible” when it comes to diving helmets. Just to show you those are not just empty words, check this out. Two copies of Leon’s excellent out-of-print book were recently sold on eBay for nothing less than $3,720.00 and $4,615.30 USD each. 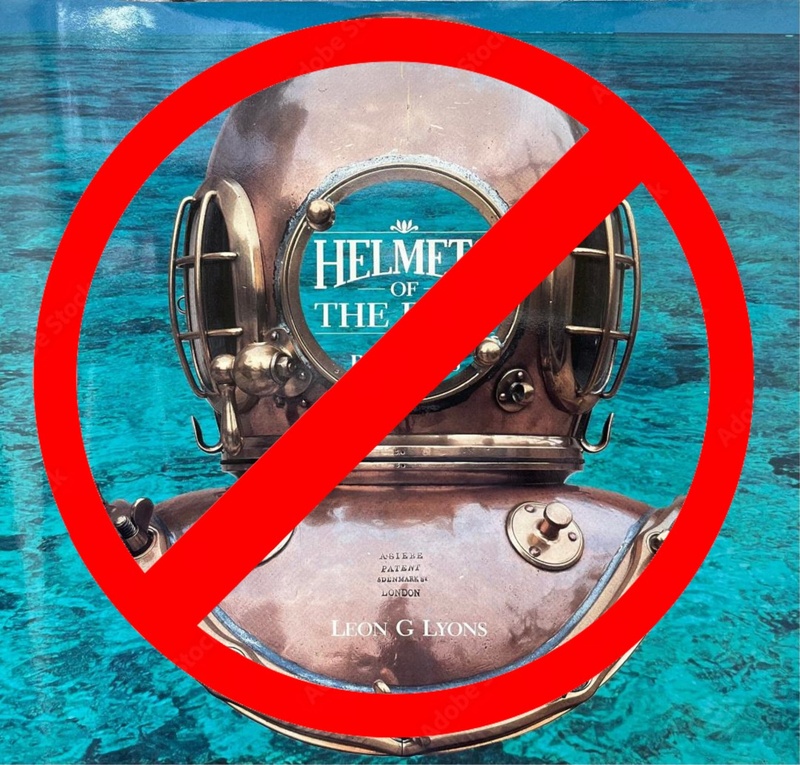 As I see it, that says a lot about how people in the diving helmet community respect Leon’s status as an authority on the subject. Talk is cheap, but when people vote with their wallets, that’s really saying something. Below I’ve pasted the cells from both auctions. I’ve removed the hyperlinks that contain information about the bidders, the winner’s identity, and so on: for the sake of preserving their privacy. Now, $8,300 for two books is a respectable chunk of change any way you slice it. And I know there are people out there who, as soon as they see somebody score big time like this, decide they want to jump on the bandwagon and do the same thing themselves. To them I say, “Don’t waste your time. It aint gonna happen.” Leon’s recognized as the premier exponent in this field: that makes his work valuable as a collectible. Subsequent knock-offs by other’s attempting to copy what Leon has achieved will not receive the same respect. 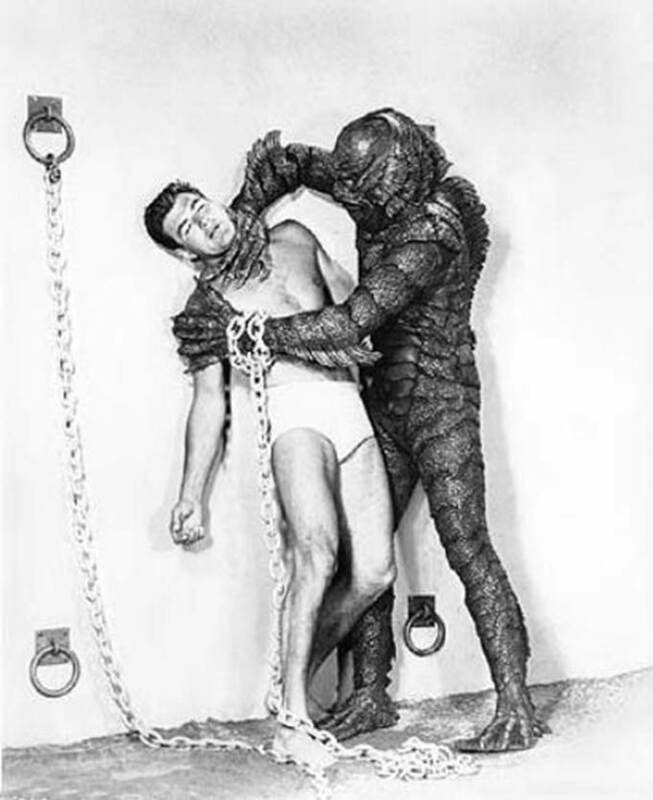 And so it is with this work by Leon G. Lyons, HELMETS OF THE DEEP. Get one if you can; it’s a good investment because the value is certain to appreciate with the passage of time. 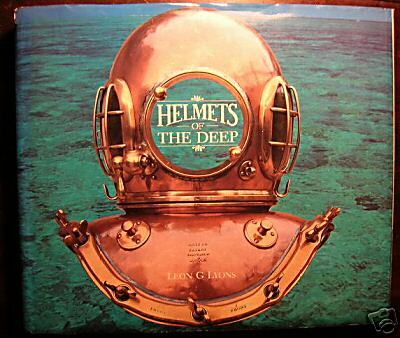 Well, the last couple days have been good for HELMETS OF THE DEEP fans. Here’s another sale on eBay that just closed at $5,747.99 USD for a single edition. 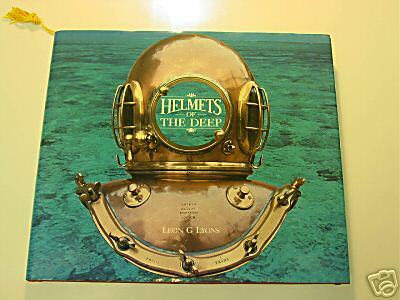 A gent in Massachusettes was the seller: he describes HOTD as “The most complete book of diving helmets in the world.” Apparently, people agree: there were 15 bids altogether. Here’s the auction cel with personal information hyperlinks removed to protect participant privacy. 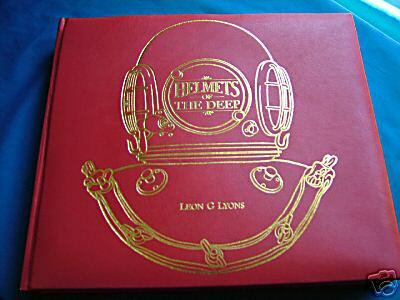 Tuesday, March 27, 2007: By popular demand, Leon Lyons is in the process of publishing an expanded reprint of HELMETS OF THE DEEP, expected to be on sale in the first quarter of 2008. The book is expected to sell out early, and reservations are highly recommended. NEW! AUGUST 01, 2007: Underwater photographer DAVID HAAS recently provided us with a CD of images he took during a visit to the Lyons’ Maritime Museum. I wish I had the time and space to show them all to you, but here are a few I thought were interesting. 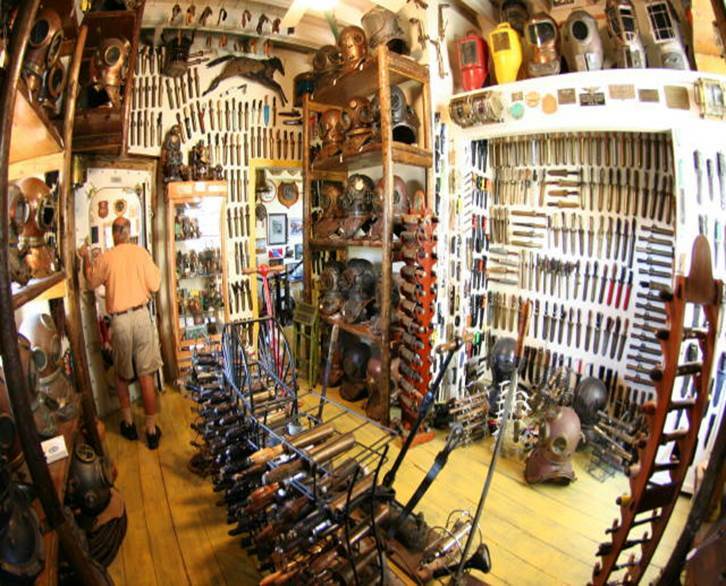 Here’s a panoramic look at the knife collection area. 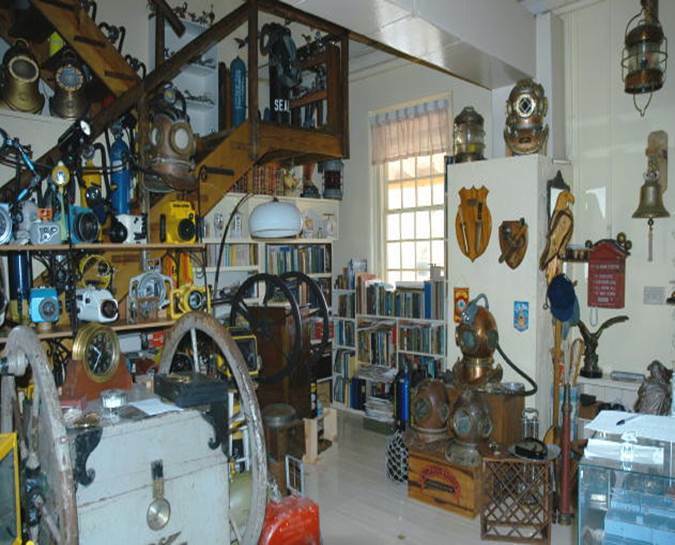 And a great wide angle view of the museum as you’re looking towards the stairway to the loft. 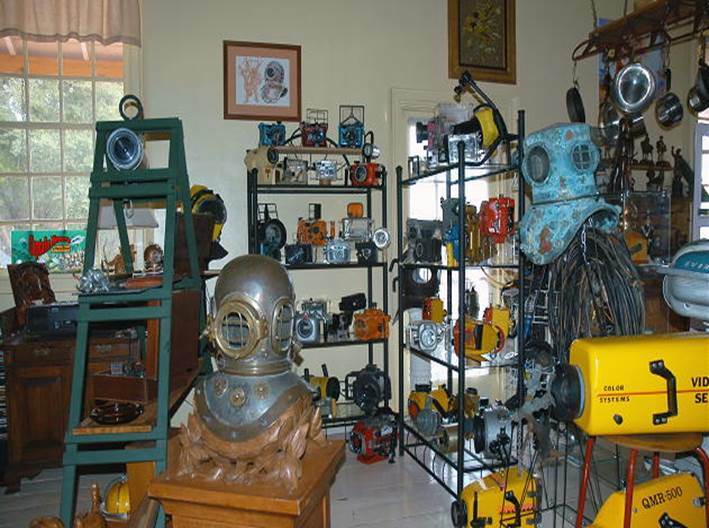 So much of Leon’s collection is esoteric vintage equipment: like these U/W camera housings. Could you identify this helmet? The plate says SEIBE GORMAN, but I’ve never seen one quite like it. 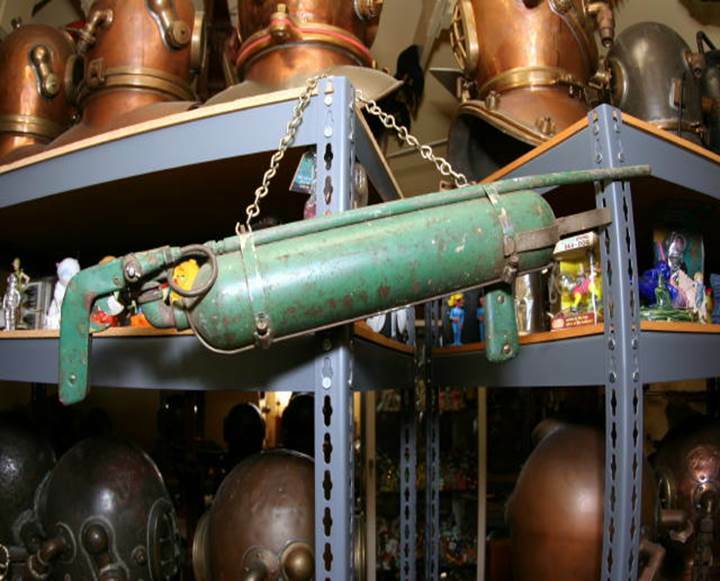 Here’s a vintage pneumatic spear gun, similar to the one used in the original CREATURE FROM THE BLACK LAGOON movie. 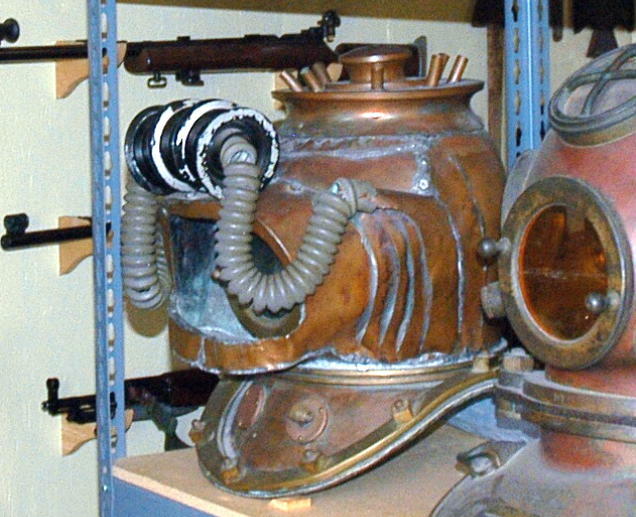 Looking at the basic design, one could wonder if this mightn’t have been part of the inspiration for the underwater rifles seen in Disney’s 20,000 LEAGUES UNER THE SEA. Same basic configuration; fairly characteristic of 1950’s design. Okay, ya talk about interesting helmets. That one bottom center with the dual hoses is a DESCO I’ve never seen before. 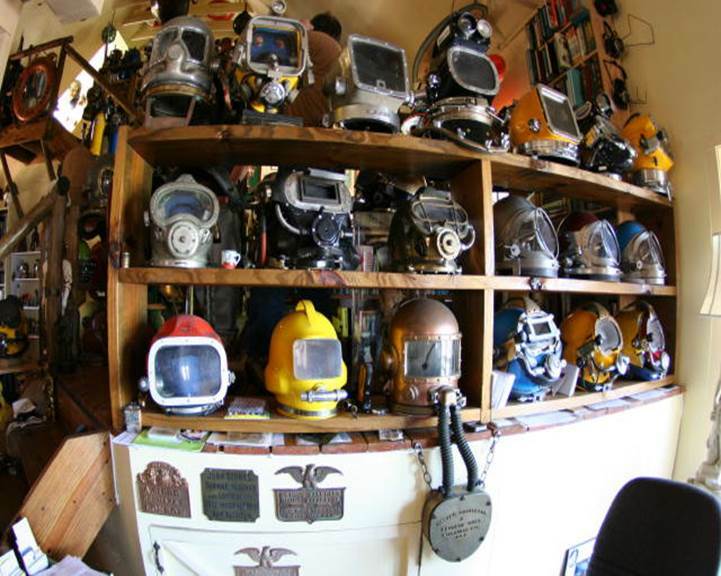 I see a few Joe Savoie’s; and that “Rocketman” looking hat on the top left is new to me altogether. And here’s one I cropped to fit the page: portrait of a guy who loves what he does. Thanks for the pictures, Dave! And here's a video of Leon diving in 1994.